Advocates for livable streets in New Haven have high hopes for the Downtown Crossing/Route 34 West projects, made possible by a highway teardown that will open 16 acres of prime, center-city land. But the opportunity to create a better connected, more people-friendly place is off to a disappointing start. 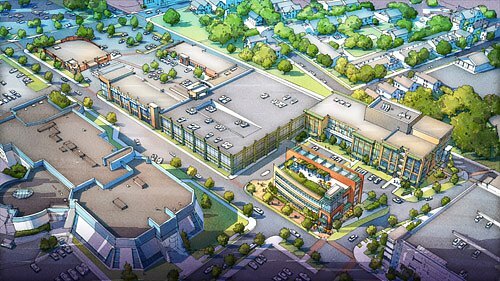 Last week, the New Haven Board of Alders unanimously approved phase one of the project — a 5.5-acre site that had been obliterated to make way for the highway during the urban renewal era, but never saw the planned road construction. For decades, the block has been little more than an enormous parking crater. Plans call for the area — dubbed Route 34 West, call for a medical office building, a Rite Aid, and the headquarters of a nonprofit mental health caregiver. And oh yes, the development will also include an 800-space parking garage. Meanwhile, at the city’s insistence, a “temporary” 500-space parking lot will also be added near the site. Farwell is disappointed developers apparently plan to do nothing to expand transportation options as part of the project. Residents have urged the city to consider bike lanes on adjacent streets, but the city has not yet made any commitment to them or to expanding transit. City officials said they couldn’t eliminate a large parking lot — the site formerly held about 600 spaces — without replacing the car storage. The 500-space lot is only supposed to last five years — until the businesses can develop another location or encourage employees to use other modes of transport, city officials say. Unfortunately, this sort of thing is necessary in New Haven. The suburbs are low density, there’s not much new multifamily residential in town aside from 360 State, and there’s nowhere near enough transit infrastructure (and, with narrow streets downtown, no quick-fix transit solutions). Yale students almost uniformly don’t drive, but Yale staff fill vast surface parking lots that blight most of the city. Even Union Station is overshadowed by massive multistory parking structures because townies drive even when they take the train. Unless you’re building student-oriented projects, parking is still a necessity. The Dwight and Hill neighborhood that will be impacted spoke against the garage and promoted mixed use and residential, This is a giant wall between the two communities. This has not one component of interconnectivity to communities. The alderman voted in favor of the developer and not the neighborhoods adjoining this development.